The wound-rotor induction motor (sometimes called a slip-ring motor) is a variation on the standard cage induction motors. Wound-rotor motors have a three-phase winding wound on the rotor, which is terminated to slip rings. The operation of the motor can be summarized as follows. The rotor slip rings connect to start-up resistors in order to provide current and speed control on start-up. When the motor is started, the frequency of current flowing through the rotor windings is nearly 60 Hz. Once up to full speed, the rotor current frequency drops down below 10 Hz to nearly a DC signal. The motor is normally started with full external resistance in the rotor circuit that is gradually reduced to zero, either manually or automatically. This results in a very high starting torque from zero speed to full speed at a relatively low starting current. With zero external resistance, the wound-rotor motor characteristics approach those of the squirrel cage motor. 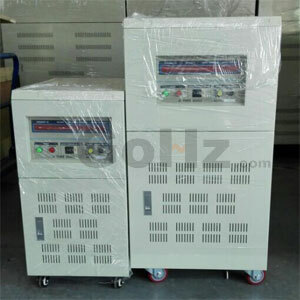 Interchanging any two stator voltage supply leads reverses the direction of rotation. A wound-rotor motor is used for constant-speed applications requiring a heavier starting torque than is obtain able with the squirrel-cage type. 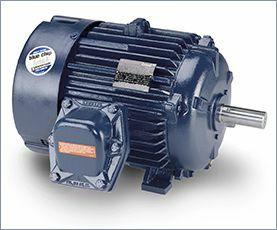 With a high-inertia load a standard cage induction motor may suffer rotor damage on starting due to the power dissipated by the rotor. With the wound rotor motor, the secondary resistors can be selected to provide the optimum torque curves and they can be sized to withstand the load energy without failure. Starting a high-inertia load with a standard cage motor would require between 400 and 550 % start current for up to 60 seconds. Starting the same machine with a wound-rotor motor (slip-ring motor) would require around 200 % current for around 20 seconds. For this reason, wound rotor types are frequently used instead of the squirrel-cage types in larger sizes. Wound-rotor motors are also used for variable speed service. 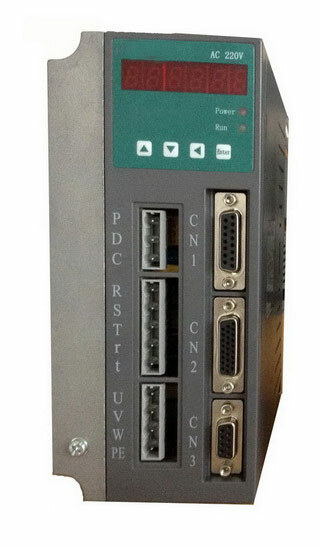 To use a wound-rotor motor as a variable speed drive, the rotor control resistors must be rated for continuous current. If the motor is used only for a slow acceleration or high starting torque but then operates at its maximum speed for the duration of the work cycle, then the resistors will be removed from the circuit when the motor is at rated speed. In that case they will have been duty cycle-rated for starting duty only. Speed varies with this load, so that they should not be used where constant speed at each control setting is required, as for machine tools.